ABP Southampton has installed a new hi-tech weather station. This will give greater and more accurate assessment of weather conditions providing safer boarding for Pilots on vessels. The station on the Nab Tower Lighthouse, on the eastern approach to the Solent, has had the new weather station fixed on to it in partnership with Trinity House, the General Lighthouse Authority for England, Wales, the Channel Islands and Gibraltar and owner of the tower. “Safety for our teams is the number one priority. As Pilots board vessels while they’re still moving, it’s vital that we provide the launch Coxswain and Pilot with as accurate information as possible to support them in making critical decisions. 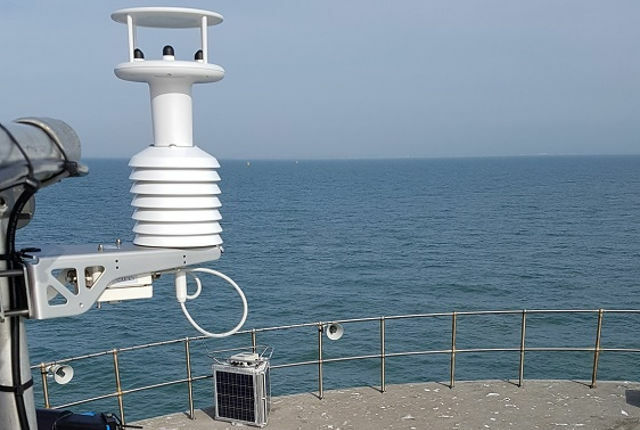 “Trinity House is pleased to partner with ABP Southampton by providing a platform and power for the new weather station on Nab Tower Lighthouse. ABP’s Engineers designed and delivered the new weather station, which is powered from the lighthouse’s solar-powered battery bank. 1 Comment on "Nab Tower gets new upgrades to make the Solent safer"
Will the data collected be available to the general public as is Bramblenet and Calshot data?